As the holidays are now fully upon us, details have been released for The Refectory’s schedule for the season, offering several chances to enjoy a sublime combination of world-class cuisine and excellent live jazz, both local and global. While the Phil Clark Quartet kicks off the schedule with a swingin’ Sinatra-style holiday show this Saturday, December 3rd (event details here), and Byron Stripling and Bobby Floyd follow with a sold out show on Friday the 23rd, the bulk of The Refectory’s holiday jazz takes place in the last week of the year. On Monday, December 26th, the Liz Woolley Band (event details here) will perform holiday favorites and their own tunes in their vibrant style blending classic jazz and modern pop. Read Woolley’s 2015 JazzColumbus interview here. On Tuesday, December 27th, trumpeter and Global Ambassador for Jazz at Lincoln Center Dominick Farinacci and band (event details here) will perform his innovative, globe-trotting material, including his 2016 album Short Stories. And on Wednesday, December 28th, international organ legend Tony Monaco (event details here) will lead a trio for a night of festive seasonal favorites, soulful standards, and grooving original tunes. The week ends with revered 50’s/60’s cover band The Randys on December 29th and folk outfit Jesse and Jonny Quartet on December 30th. Each event starts at 6pm, and reservations (required) can be made by calling 614-451-9774. Keep reading for more thoughts on the Dinner Music Series and info on the food and beverage selections for each performance. After starting with 6 concerts in 2012, the Dinner Music Series at The Refectory will end up presenting over 100 performances in 2016, including about 70 Jazz Dinner Club shows along with great opera, chamber music, folk and more. I had the opportunity to see the Nashville-based soulful fusion ensemble Dynamo at the restaurant recently, and was once again impressed by the combination of fine dining and intimate live jazz. The four course meal provides a delicious variety, and will surely please well-trained and novice (yours truly) palates. As far as music goes, the Choir Loft truly serves as one of the best listening rooms in the area. With carefully arranged seating for about 40 patrons and a small space for the band to perform, which was a challenge acccepted gracefully by the 10-piece Dynamo, the sound system is setup perfectly for the audience to enjoy an upclose show without being blown away. The Jazz Dinner Club brings in acclaimed local jazz artists as well as a fine selection of up-and-coming touring bands, so check out one of the above shows and keep an eye on their website (or our calendar) for future opportunities for a one-of-a-kind night out. Chef Richard Blondin, the Refectory Executive Chef for 25 years, creates a Four-Course Dinner for each of the Dinner Music Series evenings. The menu is created exclusively each week for the event, and reflects his culinary training as a native of Lyon, France. The evening begins with a Chilled Appetizer, followed by a Hot Appetizer Course and then the Entrée. An amazing dessert is served during the intermission of the show, timed perfectly to enjoy the second set of the “dining and music experience” that is unlike anything else in Columbus! Chef Richard is happy to adjust the set menu based on your dietary restrictions or concerns. Special orders are not taken the evening of the performance but can be made when making the required advance reservation. To complement each of the four courses, the Refectory also presents an optional wine flight pairing to create a wonderful symphony of food and wine. Upon arrival, guests are greeted with a sparkling wine aperitif to set the stage and mood for experiencing the unique atmosphere of the most intimate dinner music venue in central Ohio. 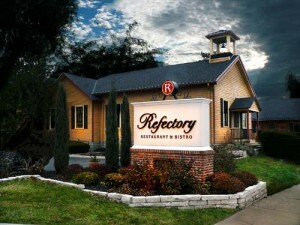 The incredible cuisine, the wonderfully matched wines, the amazing music and the intimate venue have rapidly made the Refectory a destination for a completely unique and magical special evening out!